The old-fashioned way to clear trees and brush was to burn it: Creating air pollution, possibly starting a wildfire and taking years to fully rid a small space of all the shoots and seeds that can regrow. Modern-day mulching is quick, easy, safe, and (for us) a whole lot of fun: we can drive a T-870 Bobcat straight through all but the densest forest, turning everything in the vehicle’s path into mulch that can be used as fertilizer and wood chips that can be used everywhere from rodeos to front yards. Our equipment consists of nimble and easily transported 100 horse mulching units. No matter what application, we have the mulching unit that will suit your needs. We also boast the CMI 250– a 275 horse, high-output workhorse. Known in the industry as one of the best and highly sought after machines, this unit has the lowest ground pressure in the industry and leaves a near seed-able finished product. 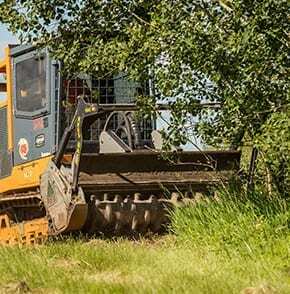 All units are equipped with safety features to keep us on track, whether we are creating access for power line construction or repair, clearing right of ways, fencelines or oil leases. 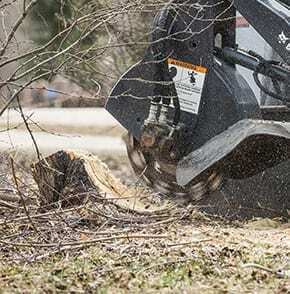 If you need large areas, small bushes and saplings cleared and manicured, we’ve got powerful CMI machinery and rotary mower heads that have the strength to cut through trees up to three inches in diameter—ideal for public spaces and farms, but also for construction sites and utility lines. 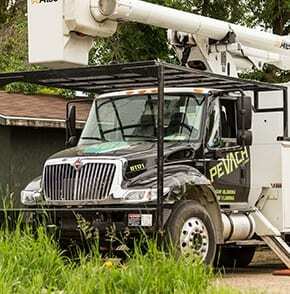 Our state-of-the-art bucket trucks lets us scale the tallest trees with the touch of a button, and when we’re feeling a bit nostalgic we’ve got the right training and equipment to make like Tarzan and scale a tree. Our Utility Tree Trimmer specializes in clearing utility lines and creating access – call us for more information on what we can do for utility companies. Whether it’s taking a tree out of your yard before it comes down on your roof or landscaping parks and golf courses, trees need moving and we’ve got the tools to do it. We can pick up and put down a living tree wherever you want, and if you just want the tree gone we’ll donate it to somebody who needs it rather than just chipping it. and we know that giving back is a part of any great company.